Original Bill's Steak Strips is a new product that launched last May 2014 by Original Bill's Beef Snacks of New Holland, PA.
Named for Bill Sprecher, a jerky industry veteran with other popular brands, Original Bill's is Sprecher's culmination of expertise on what he feels makes irresistible and bold tasting meat snacks. Original Bill's is hang-hung eye of round strips, naturally smoked with hickory and apple wood. 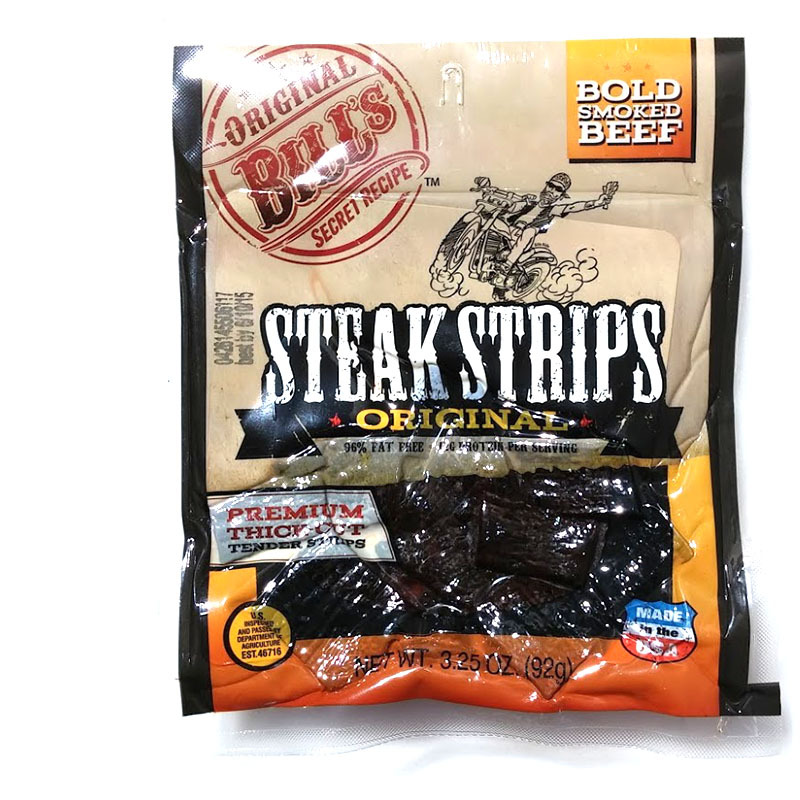 Original Bill's Steak Strips is currently available in this Original variety, as well as Teriyaki and Hot, and is currently making its way across the country into travel centers, truck stops, and convenience stores. The brand is actually a subsidiary of DAS Companies, Inc., a consumer products distributor. The first flavor that hits the palate is a light smokiness with oil. A light saltiness comes on along with a touch of sweet. The chewing brings in more of the savory component, such as hints of soy sauce with a garlic and onion seasoning. I can also pick traces of black pepper in the back of my mouth. 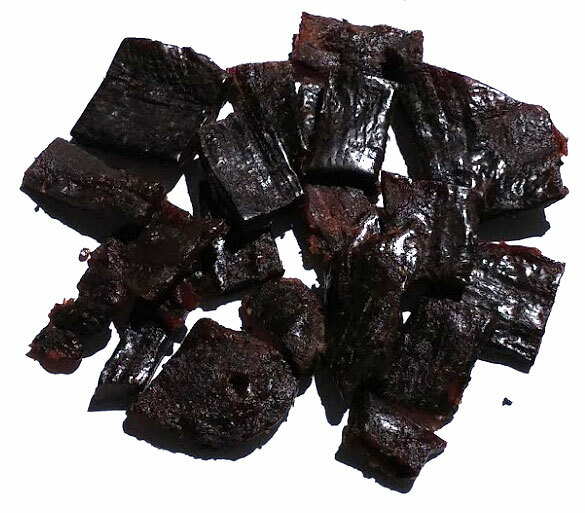 Otherwise, the flavor that largely defines this jerky is the savory character of soy sauce, garlic, and onion. The light smokiness continues throughout the chewing, along with that oily flavor, while the light black pepper aftertaste colors the background. I don't pick up much of any natural meat flavors. As for spiciness, the black pepper creates a touch of heat, but not enough to push this above mild. The meat consistency seems great, with no visible signs of fat, no stringiness, and nothing unchewable. The bite sized pieces are overall easy to chew. The chewing texture starts out with faint bit of rubber character, but quickly breaks down into something meaty. It doesn't chew like real steak, however, it tends to have a crumbly nature, though still meaty. Verdict: This Original variety of Original Bill's Steak Strips generates a good deal of snackability with its savory character, easy chewing, and bite sized pieces. 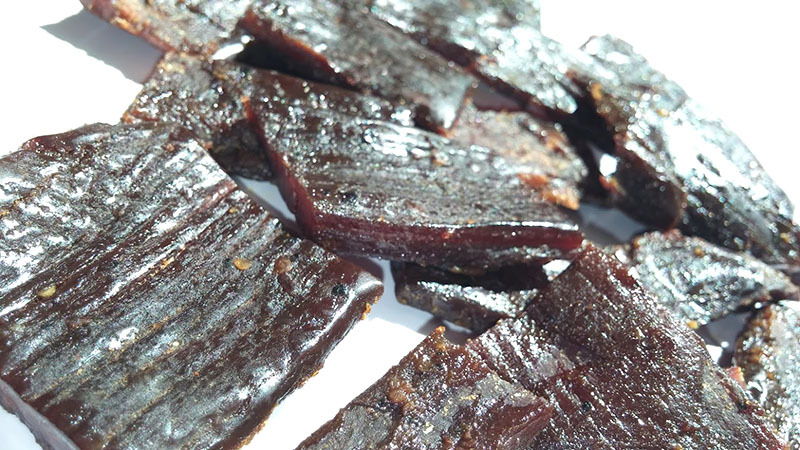 The real wood smoke flavor is this jerky's best redeeming quality. Having said that, it competes well against major brands of jerky (Jack Link's, Slim Jim, Oberto, et al), offering better flavor, more bold and more smokey. But against gourmet brands, it struggles to define itself as new and exciting, having an unremarkable flavor and a somewhat crumbly chewing. Still, Original Bill's Steak Strips seems to push the bar up another notch in the meat snack industry front with its bolder flavor and real wood smoke.